Battery operated train set. 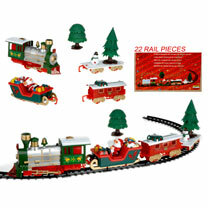 Set includes four straights, 10 curves, switch track, locomotive, santa sledge, santa closed wagon, Christmas tree wagon and two trees. Two AA batteries required (not included).